RM8X4 has high commonality with the RM8 and is intended for strategic and maritime data communications where size, weight, power and cost are at a premium. RM8X4 offers a wide range of standards- based waveforms and protocols suitable for interoperable link setup operations and data transfer, whether point-to-point or point-to-multipoint. 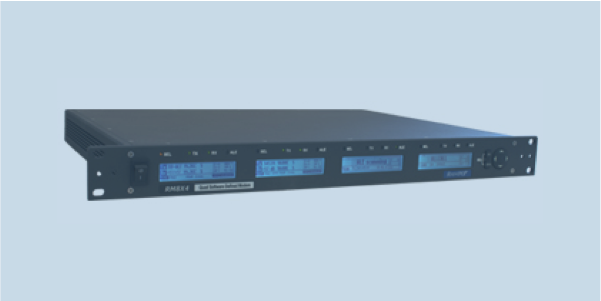 The RM8X4 is capable of 4-channel receive diversity processing offering a significant performance gain and making the RM8X4 ideal for naval and maritime shore station deployment in 19-inch racks occupying only a single 1U slot. Operation of the RM8X4 is determined by the selection of a built-in modem software pack. RapidM offers a choice between HF & WBHF modem and ALE 2G/3G controller software packs that can be activated with the appropriate RapidM activation key.